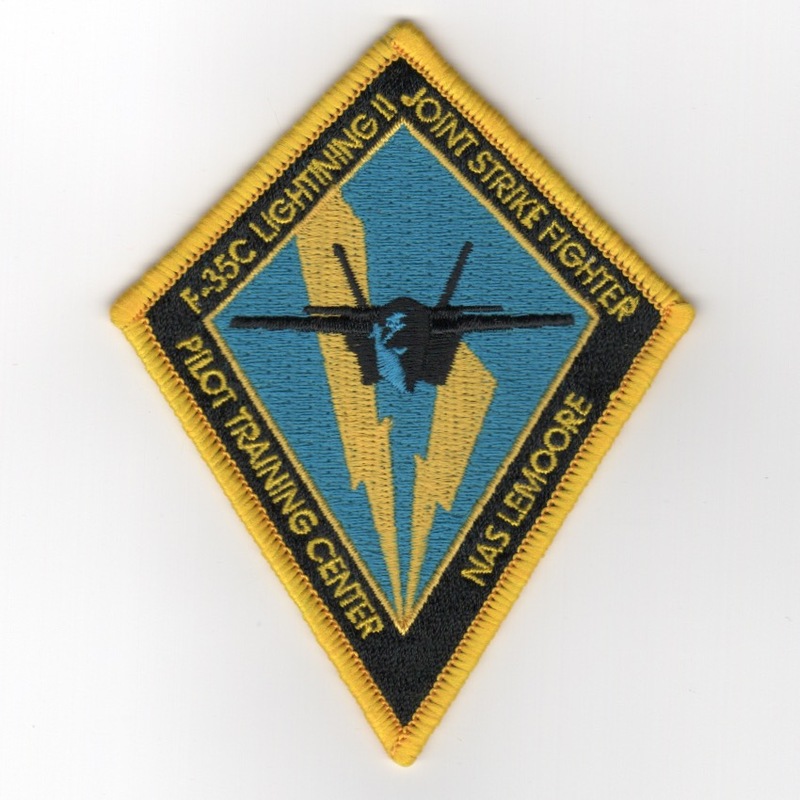 This patch was created by AV8RSTUFF for the F-35 Joint Strike Fighter (JSF) Pilot Training Center located at NAS Lemoore, CA. It shows the F-35C Lightning II aircraft coming at you, with lightning emanating from the aircraft's path! No velcro attached to this patch. 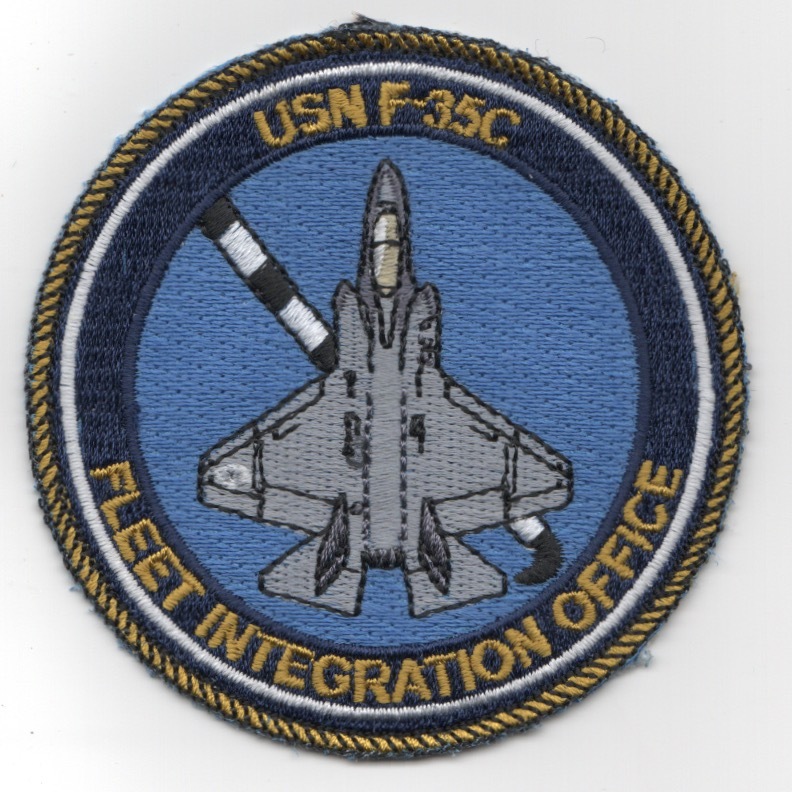 This is the blue version of the USN's F-35C 'Fleet Integration Office' bullet patch worn by those tasked with the implementation of this aircraft into the Naval Aviation fleet. It does not come with velcro attached. 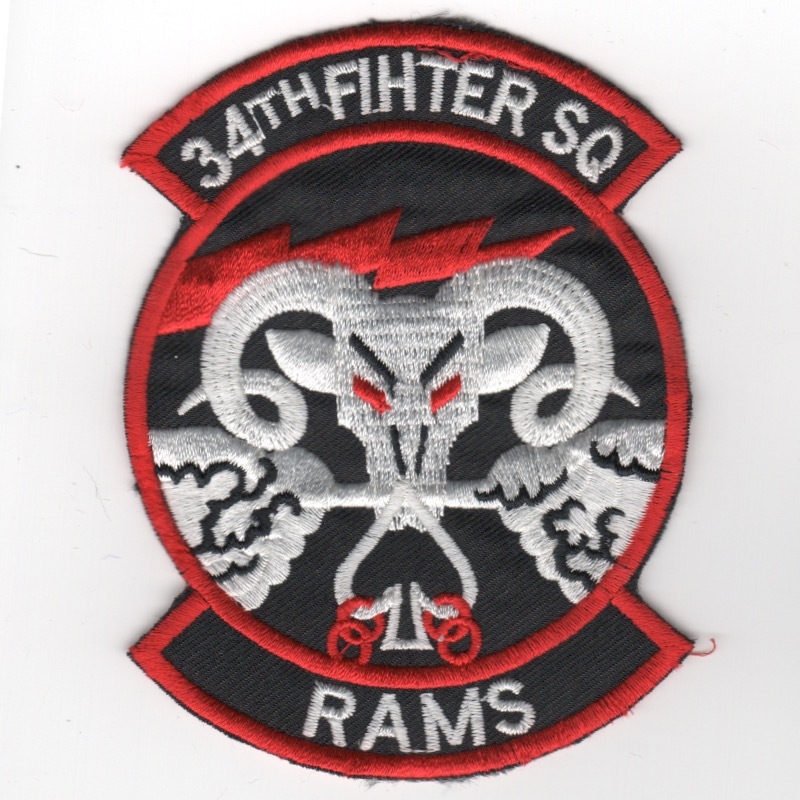 This is the color version of the 33rd Fighter Wing patch for the squadrons stationed at Eglin AFB, FL that fly the F-35 aircraft. It does not have velcro attached. 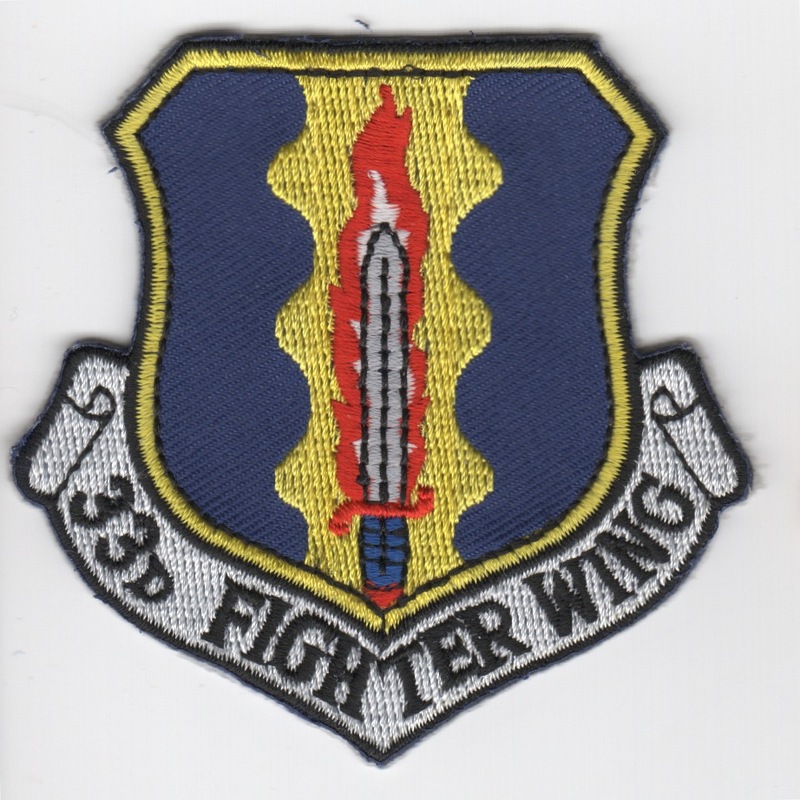 This is the desert version of the 33rd Fighter Wing patch for the squadrons stationed at Eglin AFB, FL that fly the F-35 aircraft. 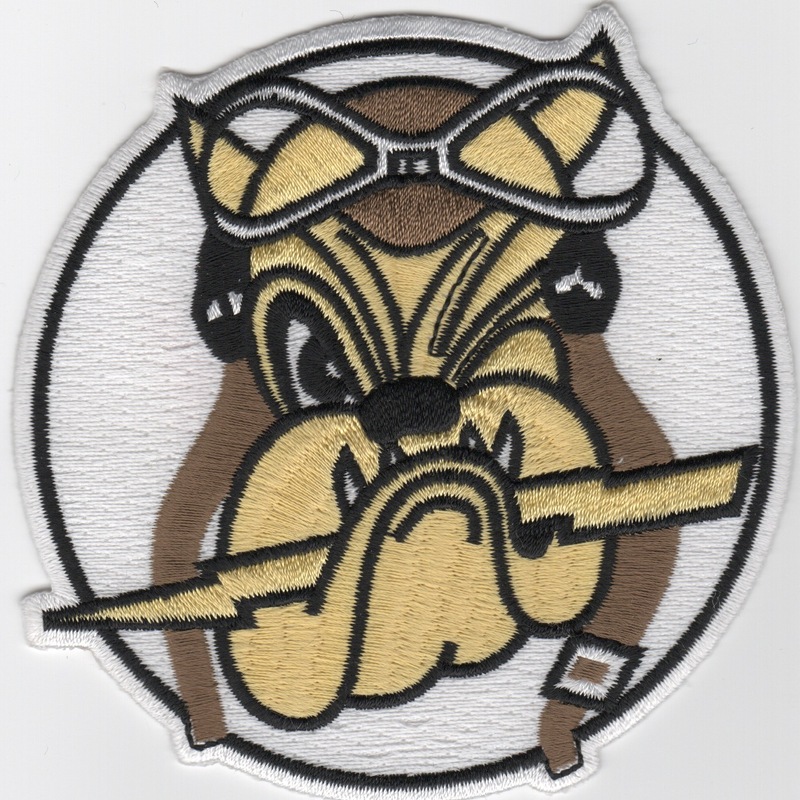 This is the leather-bordered color version of the 33rd Fighter Wing patch for the squadrons stationed at Eglin AFB, FL that fly the F-35 aircraft. 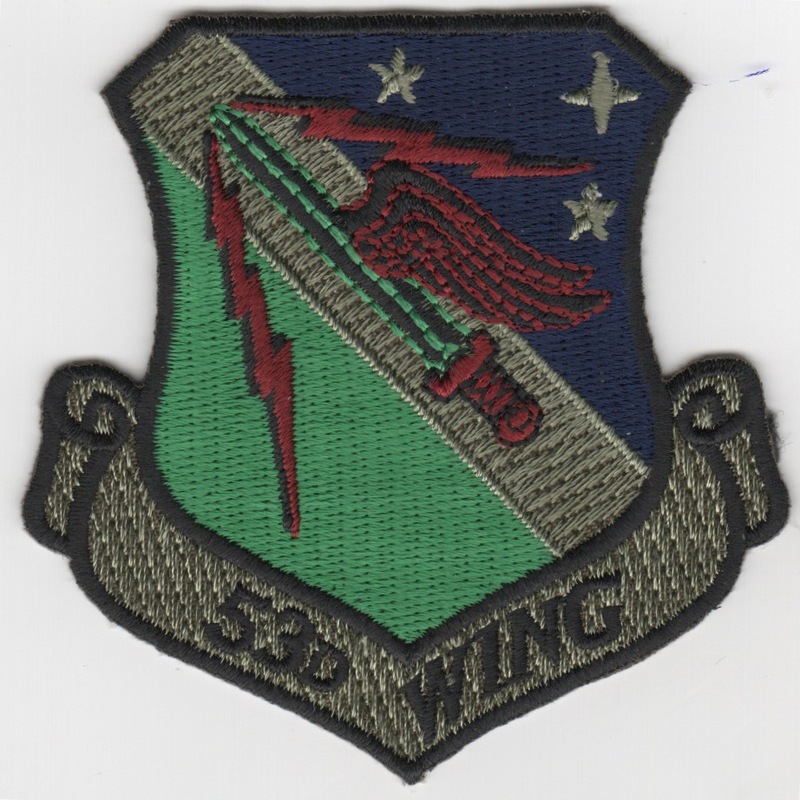 The 53d Wing (53 WG) is a wing of the United States Air Force based at Eglin Air Force Base, Florida. The wing reports to the United States Air Force Warfare Center at Nellis Air Force Base, Nevada, which reports to Headquarters Air Combat Command. This patch does not come with velcro already attached. 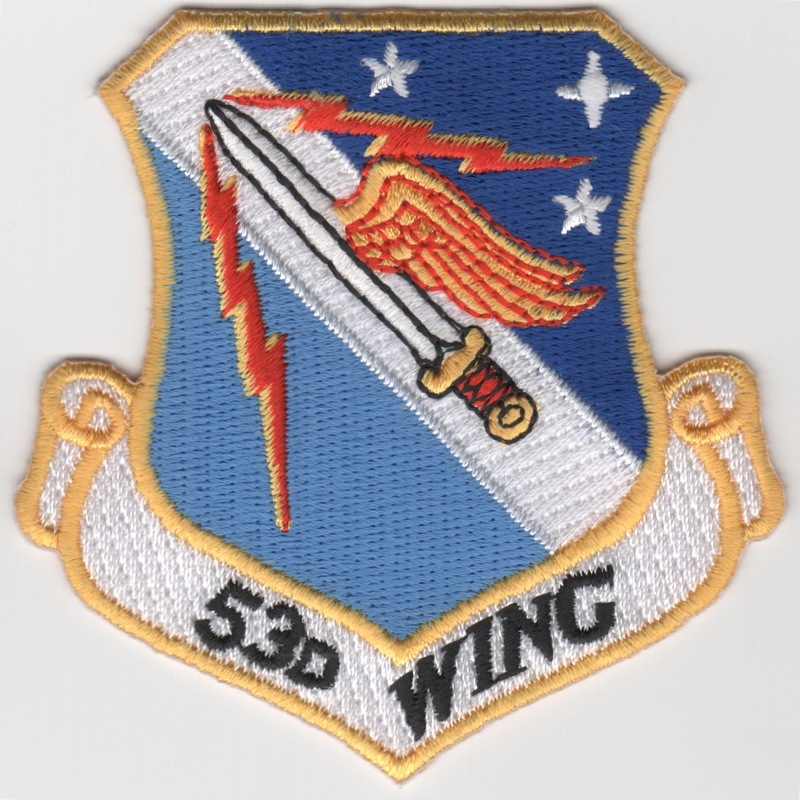 The 53d Wing (53 WG) is a wing of the United States Air Force based at Eglin Air Force Base, Florida. The wing reports to the United States Air Force Warfare Center at Nellis Air Force Base, Nevada, which reports to Headquarters Air Combat Command. This is the subdued version of their crest patch and does not come with velcro already attached. 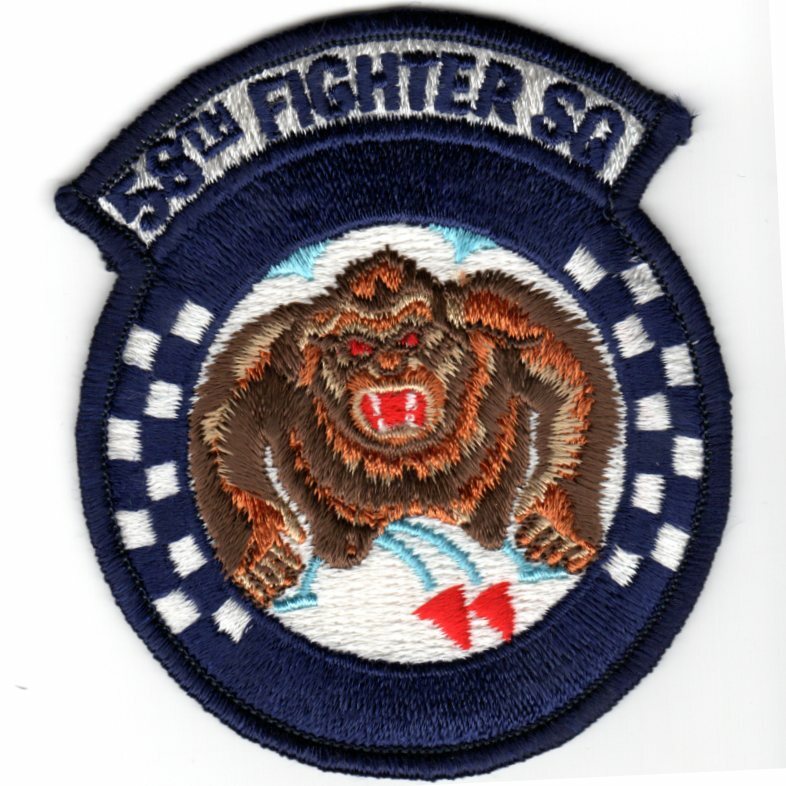 This is the color version of the squadron patch for the 58th Fighter Squadron (58 FS) which is part of the 33d Fighter Wing, a joint graduate flying and maintenance training wing for the F-35A, B, and C, organized under Air Education and Training Command's 19th Air Force, at Eglin Air Force Base, Florida. Its mission is to train US Air Force operators and maintainers on employment and maintenance of the F-35 Lightning II "A" model, as part of the overall 33d FW mission of training American and international aircrews and maintainers of US Air Force, US Navy, US Marine Corps, and international Air Forces. This patch does not come with velcro already attached. 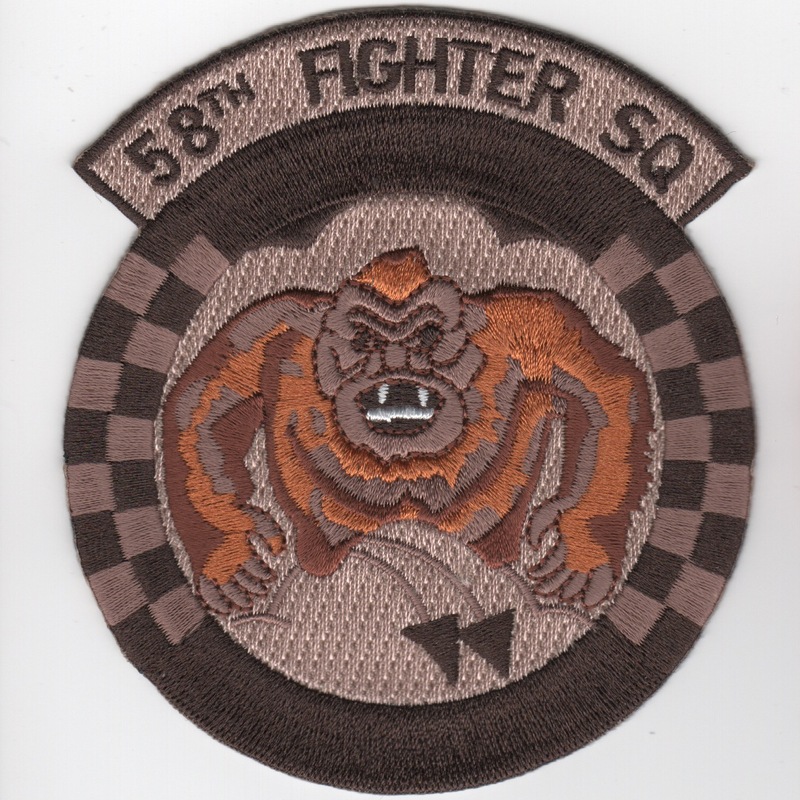 This is the desert version of the squadron patch for the 58th Fighter Squadron (58 FS) which is part of the 33d Fighter Wing, a joint graduate flying and maintenance training wing for the F-35A, B, and C, organized under Air Education and Training Command's 19th Air Force, at Eglin Air Force Base, Florida. Its mission is to train US Air Force operators and maintainers on employment and maintenance of the F-35 Lightning II "A" model, as part of the overall 33d FW mission of training American and international aircrews and maintainers of US Air Force, US Navy, US Marine Corps, and international Air Forces. This patch does not come with velcro already attached. 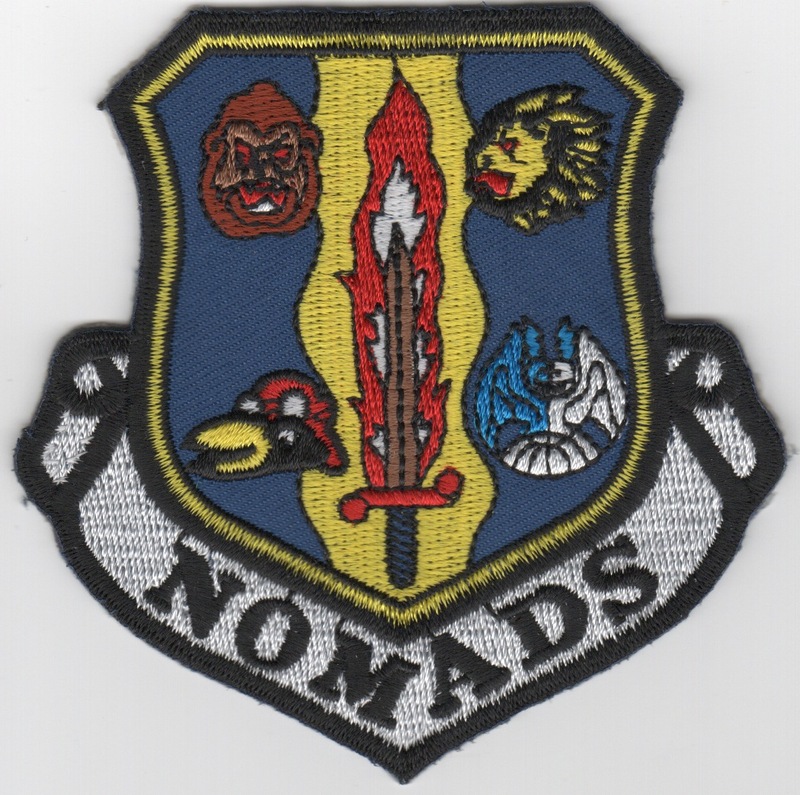 The 61st Fighter Squadron (61 FS) is an active United States Air Force unit, assigned to the 56th Operations Group, at Luke Air Force Base, Arizona. It operates the F-35 Lightning II aircraft, conducting Instructor Pilot training. The 61 FS, known as the 'Top Dogs', fly F-35A aircraft, to train instructor pilots and initial qualification pilots for Air Combat Command assignments. This patch does not come with velcro attached. The 61st Fighter Squadron (61 FS) is an active United States Air Force unit, assigned to the 56th Operations Group, at Luke Air Force Base, Arizona. It operates the F-35 Lightning II aircraft, conducting Instructor Pilot training. The 61 FS, known as the 'Top Dogs', fly F-35A aircraft, to train instructor pilots and initial qualification pilots for Air Combat Command assignments. This patch comes with velcro attached. VF-101 was the RAG (Replacement Air Group, ie, the training squadron) for the F-14 Tomcat out of NAS Oceana, VA. When the Tomcat decommissioned, the squadron was deactivated for a short while before being reinstated and moved to Eglin AFB, FL where the students will undergo joint training with the USAF to learn to fly and take care of our nation's newest asset. 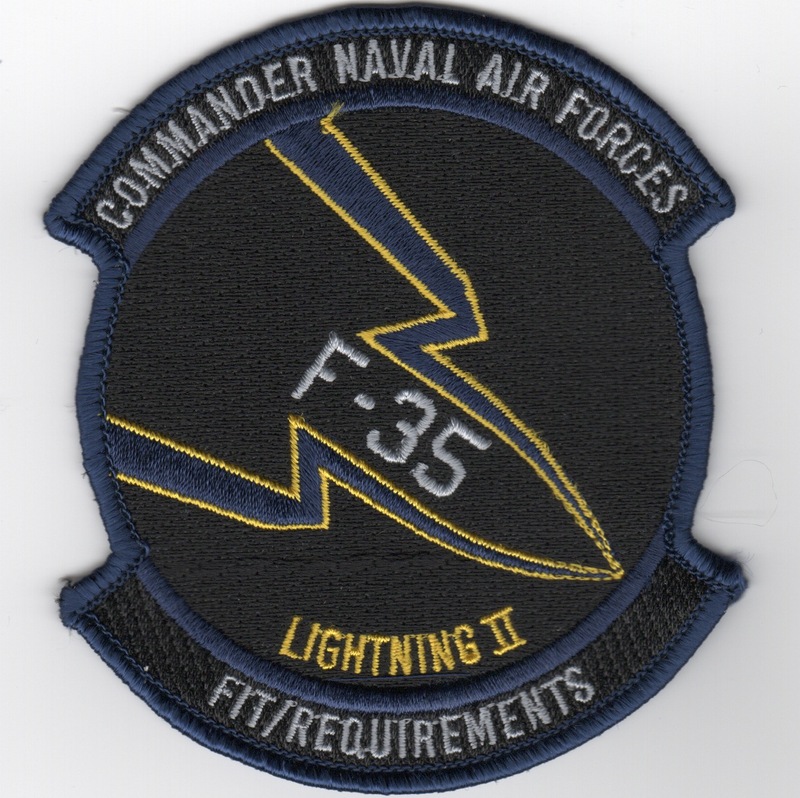 This is the patch for the F-35 Lightning II "FIT/REQUIREMENTS" and says across the top "COMMANDER, NAVAL AIR FORCES". 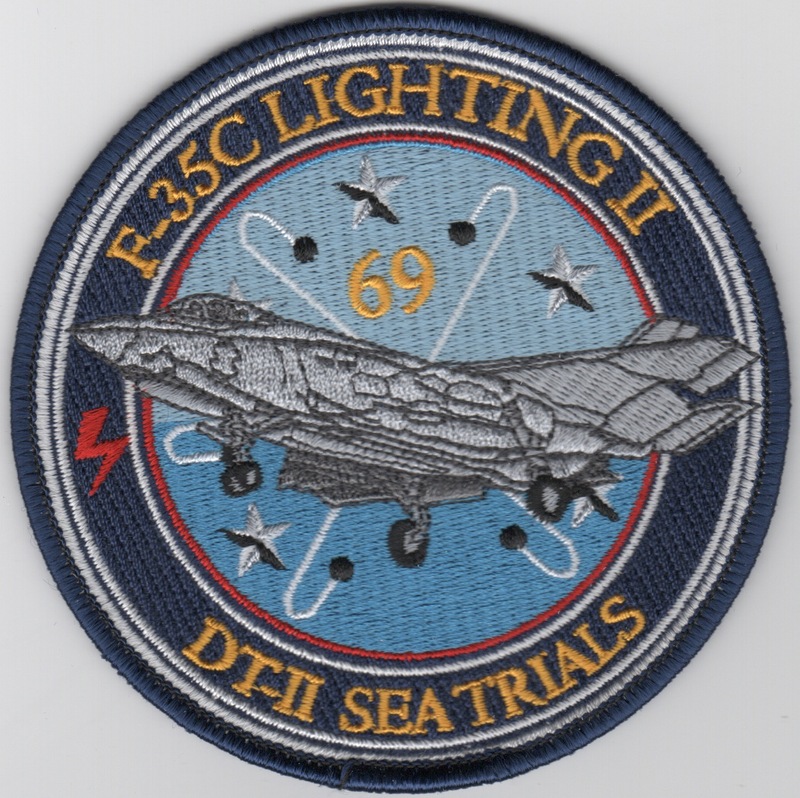 This is the Sea Trails patch created for the F-35C Lightning II in cooperations with CVN-69. Homepage | Order F-35 Patches!